The smoothness of real-time production is heavily determined by the hardware performance, polygon number, and layering of texture and visual effects. This section illustrates the concepts behind iClone performance and provides performance tuning techniques. Quick Shader supports diffuse map, opacity map and drop shadow. It’s a rather simplified pipeline allowing higher frame rates for real-time interaction, and higher frame rate of animation playback. Pixel Shader supports real-time bump, normal map, vertex shader, self-shadow, glow, reflection, etc. ; however, it takes a more complicated rendering pipeline. For users without a high-end graphics card, the speed performance for producing large scale polygon projects can be improved. Users can disable the Pixel Shader mode for faster scene creation and manipulation of streamline production. Simply turn on the Pixel Shader option to see the real-time rendered scene in the preview window after you have completed the editing. Individual effects can be turned off to improve the speed performance. 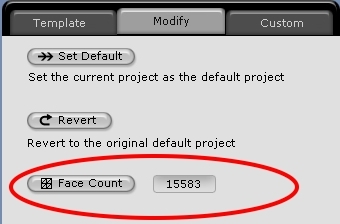 You can check the total polygon number in the project by pressing Face Count button in Project – Modify Panel . For real-time production, it’s better to keep the whole scene with nor more than 50K polygon to ensure the best frame rate and smooth interactivity for editing. If your computer performance is slow during project playback, the redraw on the Timeline could be part of the reason. Try turning off the Timeline interface if you wish to increase the playback performance. Auto-key editing is still effective even when Timeline interface is turned off. Graphic card memory size matters with the overall texture size. If you wish to create a real-time high-resolution, multiple texture project, you need to have a graphics card with large enough memory size to hold all the textures in the memory buffer. Users might need to turn on 10 tracks of the timeline for animation editing; and at the same time edit motion, do further facial animation, or fine-tune textures in imaging software. To work with multiple tasks, equipping your work environment with dual monitors could be a very effective arrangement. It can save the hassle on switching applications, making it able to view the result in real-time instantaneously.